The beautiful city of Bath is nestled on the southern most edge of The Cotswolds and is filled with many incredible and iconic Georgian buildings. Bath is a World Heritage City and its intrinsic beauty has to be seen to be believed, there is something about Bath that makes this city stand out from the rest. The city is surprisingly compact and filled to the brim with the most incredible architecture that you will find anywhere in the UK from the ancient Roman Baths to the wonderful sweeping and elegant Georgian Terraces. There are plenty of green spaces too in which you can spend time marvelling at the beauty of some of the buildings that are found here. The city centre is relatively easy to explore on foot as everything is so neatly organised and compact. Whilst the city of bath is known primarily for its elegant Georgian terraces the city has a much longer history behind it. 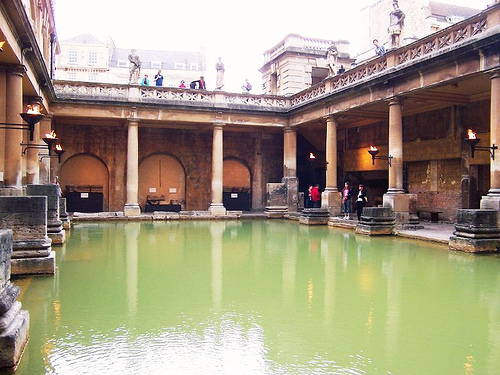 In Roman times the city was known as Aqua Sullis, a reference to the natural hot springs upon which they built their bath houses. So popular was the city that the Romans occupied the region for four hundred years. Unfortunately once the Romans left, the city was left to stagnate until the Georgians made their mark in the eighteenth century. The warm spring waters drew visitors from London in great numbers, making it the place for socialites to be when outside of London. The waters themselves drew people from all social classes to take to the baths for their believed rejuvenating and health giving properties, even Queen Anne herself and members of the aristocracy bathed here, in 1702 giving the city a very royal seal of approval. The draw of the waters and the royal connections saw the city increase rapidly in size and by 1801 Bath was the eighth biggest city in England. The city today has over 5,000 listed buildings within its boundaries including the ancient Roman baths which date from 54AD and the incredible Abbey. The city has been used as a backdrop for television series and feature films alike from Vanity Fair to Dracula. Although this is an ancient city it is not stuck in the past, as a University City there is a vibrant nightlife to be found here and some incredible restaurants that offer dining experiences that are not to be missed. Bath is also a city of festivals and music; from festivals of literature to international music festivals the city has a pretty full events calendar. This ancient and majestic city has a young and vibrant outlook, due in part to the university students. But this has always been a city where the ancient and modern have coexisted together in harmony. You can still ride the rails in style here too with the Avon Valley Steam Railway being only a couple of miles from the city, offering yet another way for the visitor to indulge in a little romancing with the past.